For some reason I ignored this book when it first came out in hardback. Not sure why. 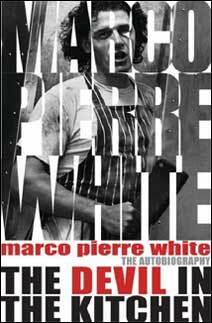 Perhaps Marco Pierre White was a name from the past and someone I knew very little about . . . except perhaps that he was rude, abusive and violent in the kitchen. How's that for prejudging someone? Don't make my mistake, this book is not to be missed. From the time I opened it at the first page until I had finished I couldn't put it down. It is well written and a fascinating account of a chef's life, albeit a pretty unique chef. Someone who has won three Michelin stars, and is the youngest chef at the age of thirty-three to have ever achieved it, has to be a very unique person. The first British Chef to win three Michelin stars. The start of the book takes you back to when Marco was just six years old and facing up to life after his mother's death, growing up in the male dominated world of his father and two older brothers. It then moves quickly through his formative years in Leeds, not particularly happy years, where his greatest pleasure was been able to escape fishing. The heart of the book is of course the time at Harveys which culminates in his winning his second Michelin star before moving to open Restaurant Marco Pierre White at the Hyde Park Hotel in Knightsbridge where he wins his third Michelin star. There is a lot more to the book than I have described. Even if you are not into cooking it is a great insight into the professional kitchen with its stress and anguish. It might also help you to understand what makes the greatest living British chef tick. Remember when he started on the road to becoming a chef he was not passionate about cooking it was just a job . . . he grew to be passionate. The book is full of stories of the high jinx that went on in the kitchens and the restaurant. From a restaurant designer getting his Gucci suit ripped apart to a chef having his whites cut up because he complained it was too hot in the kitchen . . . he was still wearing them at the time! And if I have not convinced you that The Devil in the Kitchen is worth reading then let me say it is worth reading just for the laugh you will get from the story about Raymond Blanc and the pig's trotter!